We regularly bemoan the often farcical conversation around women in politics in the United States. Let's check in with Australia and see if they're faring any better with their first female prime minister. 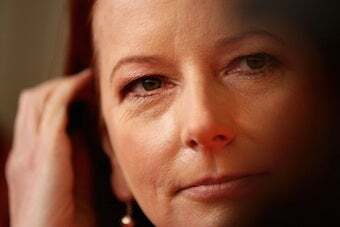 As a politician, Gillard has an impressive record. A 48-year-old former lawyer, she rose quickly through the Labor Party ranks since becoming a member of Parliament in 1998. She is quick on her feet and renowned for exercising a quick wit in parliamentary debates. She is an unabashed supporter of women's rights and, though some progressives have been dismayed by the conservative stances she has taken on issues like immigration and gay marriage, her takeover was seen by many as a welcome change. Angyal also notes that although Australia has a rep for being macho, a legacy of its frontier past, the country is used to women in power, currently including mayor of Sydney, governor general, premiers of Queensland and New South Wales. That doesn't mean forestall any crudely sexist obsessions with Gillard's personal life, though. More recently, the focus has been on the shocking fact that she is in a relationship with a man to whom she isn't married. And the man, Tim Mathieson, is a hairdresser. He might as well hand in his man card in shame. Reporters like to ask Gillard if they're getting married, presumably so as to end the national disgrace of having a first couple living in sin. It appears that Australia also has a few moralists who chide her for setting a bad example, including the columnist who sniffed, "It's fine for Gillard - a 48-year-old woman - to live with her bloke. Yet as a popular role model for women, her lifestyle choice may influence other women into making big mistakes about their lives." "He's in it as the first bloke and he'll make sure Julia is cared for at home." And that means doing all the cooking for Gillard, who has said her culinary specialty is toast and once bought him a barbecue on the strict condition that she never be asked to use it. Is it wrong to be jealous?